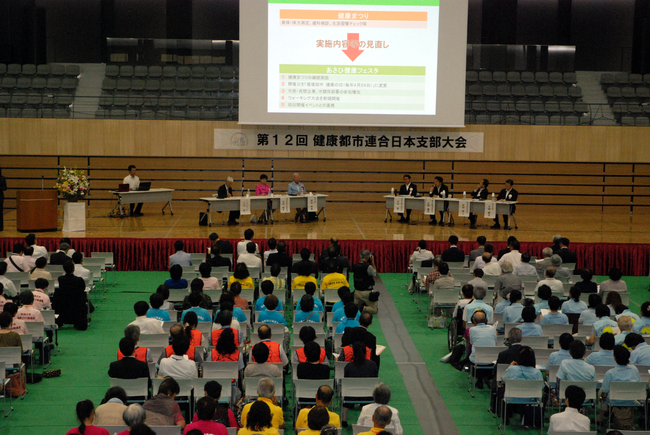 On July 26 and 27, 12th Conference of the Japan Chapter of the Alliance for Healthy Cities was held at the Kikkoman Arena in Nagareyama City in Chiba Prefecture with 1,200 participants from all over Japan. Program consisted of keynote speech, panel discussion, presentations, and attractions. 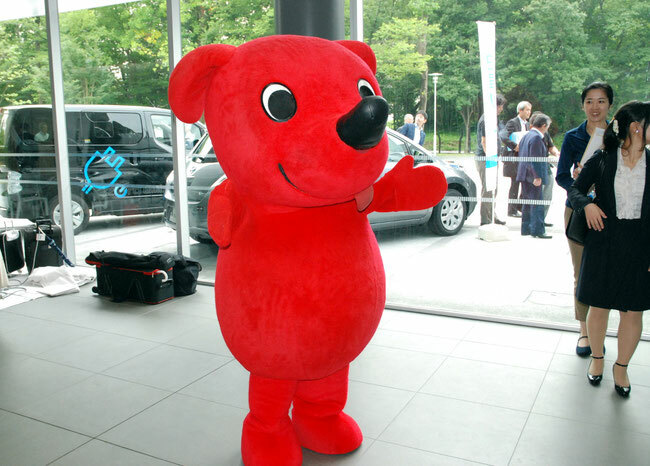 At the entrance of main arena, Cheever-kun, a mascot doll of Chiba prefecture greeted participants. As an opening attraction, Dance☆BOX, local dance team with members of kindergarteners to high-school students performed their dance. 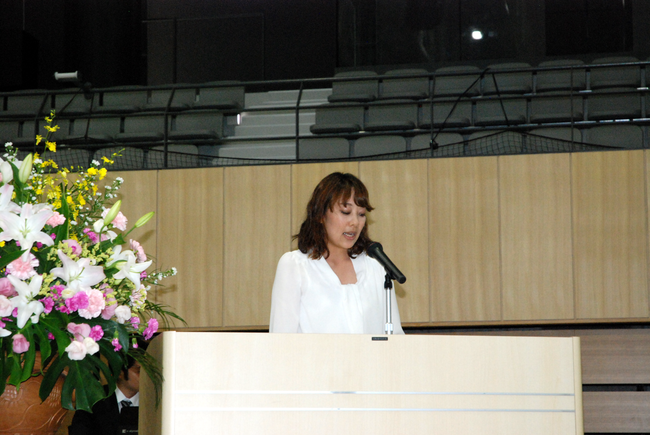 Welcome address was given by Mr. Akiyama, Mayor of Kashiwa City and Director of the Japan Chapter of the Alliance for Healthy Cities. He expressed appreciation for participating from all over Japan and hope for sharing information and deepening friendship so that participating cities will develop health promotion even further. Representing the host city, Mr. Isaki, Mayor of Nagareyama City, mentioned the city is honored to hold the conference in the year of 50th municipality anniversary, and hoped for the fruitful result with rich programs. 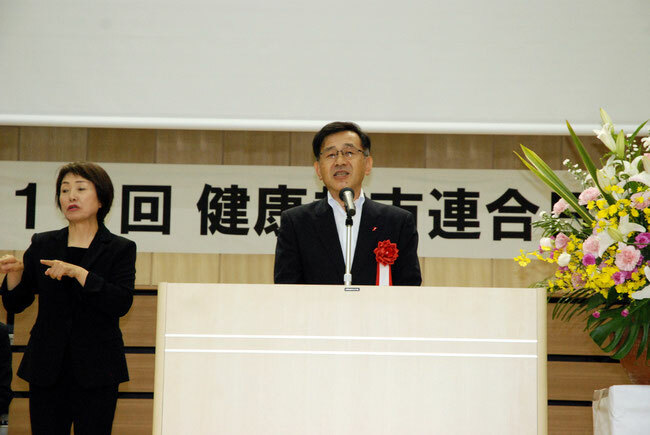 As a guest of honor, Mr. Morohashi, Vice governor of Chiba Prefecture, emphasized the importance of each citizens’ health promotion when long-term care insurance plan faces challenges in this aging society, and placed expectations on sharing experience and wisdom among citizens. Finally, Dr. Mitsuyuki Chiba, President of the NGO Healthy City Support Organization (HCSO) and Advisor of the Japan Chapter of the Alliance for Healthy Cities, reported the result of the international exchange program and called for participating Healthy Partners Project which aims at supporting municipal governments and civil volunteer groups engaging in health promotion on the basis that the Japan Chapter and HCSO are inseparable pair. 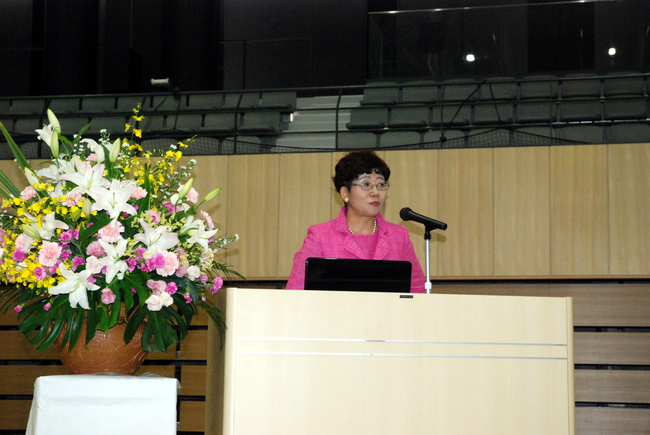 First, Dr. Keiko Nakamura, Secretary General of the Alliance for Healthy Cities and Professor of Tokyo Medical and Dental University, gave a keynote speech titled “Developing cities with health”. She pointed out that factors influencing health cover broad range from population, living conditions, income, education, nutrition, labor, lifestyle, health, medical, welfare, and infrastructure; and based on these factors, She introduced the method of city development and citizen’s role with case studies of healthy city environment plan, age friendly city, resilient city, and environmentally sustainable city. Next, Dr. Takeuchi, Professor of Tokyo University, delivered keynote speech titled "Developing cities that is environmental symbiotic and sustainable". He mentioned that nature brings both blessing and disaster, and indicated the need for resilient and environmental symbiotic society which can deal with disaster with flexibility, quoting case studies of network of water & green, woodland preservation, as well as disaster prevention utilizing ecosystem. City official of Nagareyama City in charge of nursery reported on transfer service between nursery station and nursery school. 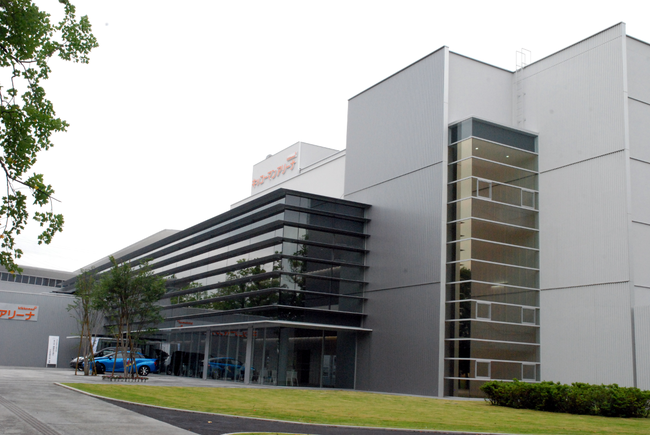 The city places nursery station at two stations on Tsukuba Express Line and provide free transfer service from the station to 34 authorized nursery schools in the city for parents’ convenience. Another city official of Nagareyama City in charge of environment reported on forest within city project where public spaces such as water site, road side, parks are used for afforestation. In addition to green environment, this project plays a role of disaster prevention and global warming prevention. The city planted 14,000 trees from 2010 to 2013, and 500 trees from 2014 to 2016. 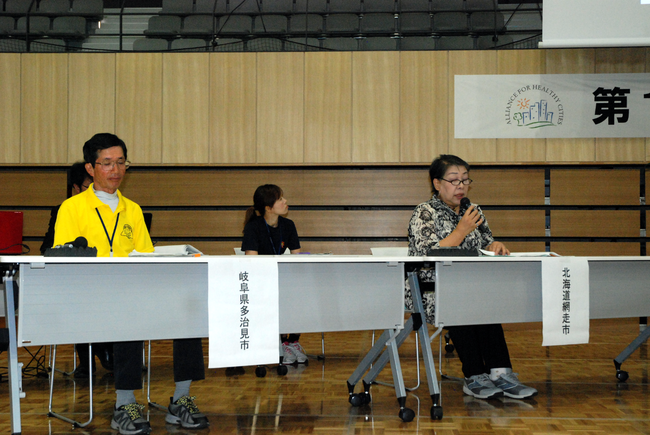 Representing Abashiri City in Hokkaido, a member of Dietary Health Mate Council reported on the cooking classes for men and seniors as well as the activities for younger generation. 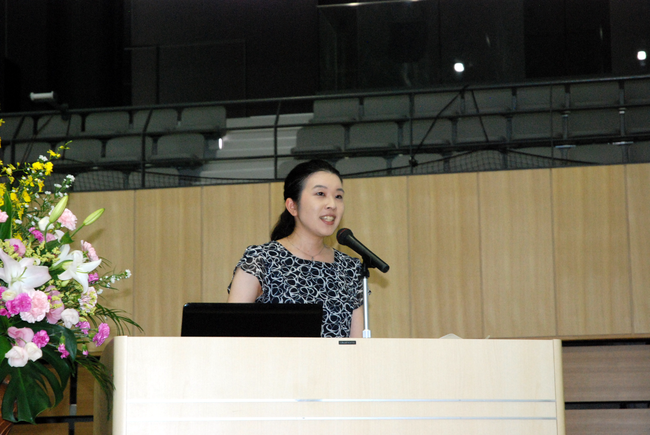 City official of Tajimi City in Gifu Prefecture introduced health promotion projects in 2016 presenting 23 walking events, physical exercise classes in 16 areas, non-smoking campaign on public road, and family walking with collaboration of children’s center. 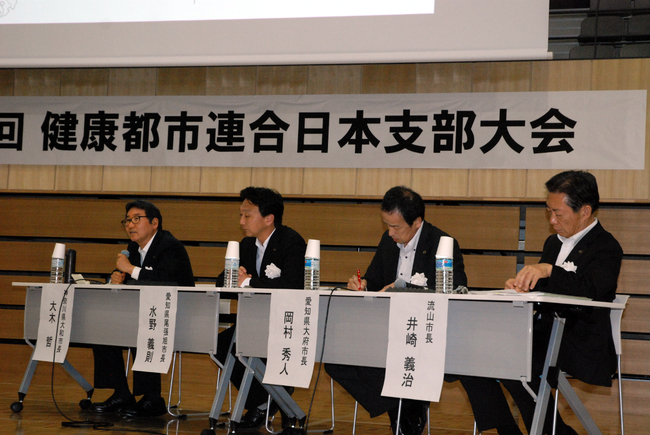 Mr. Oki, Mayor of Yamato City in Kanagawa Prefecture, Mr. Mizuno, Mayor of Owariasahi City in Aichi Prefecture, Mr. Okamura, Mayor of Obu City in Aichi Prefecture, Mr. Isaki, Mayor of Nagareyama City in Chiba Prefecture, participated the discussion, coordinated by Dr. Nakamura, Dr. Takeuchi, and Dr. Ogawa, Visiting Professor of Tokyo Medical and Dental University. 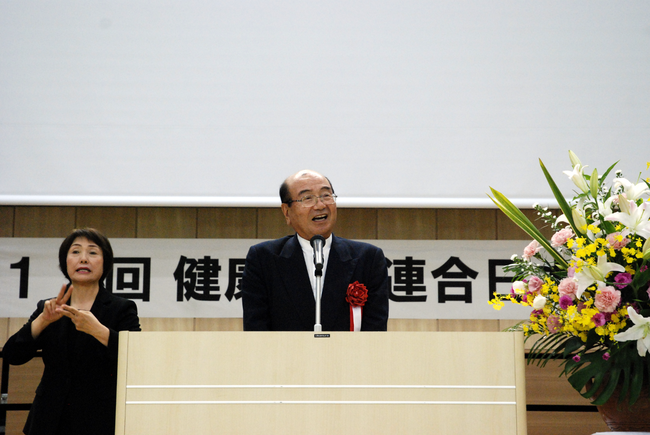 Mr. Oki refers that Yamato City applies health to all policies, and presented achievements such as zero-waiting list for nursery school, fiscal soundness, birth rate increase, profitability of city hospital, and securing necessary number of doctors. He also reported on installation of playground equipment for health promotion, public health nurse’s visiting activities for lifestyle-related disease prevention, breast cancer of examination, installation of AED, extension of community bus, and reduction of traffic accidents by bicycle lane. 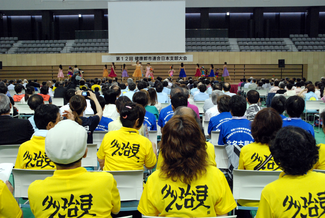 Mr. Mizuno introduced “Asahi Health Festa” as a symbol of Owariasahi’s Healthy Cities. It became a major event with 2,412 participants and 41 participating organizations. 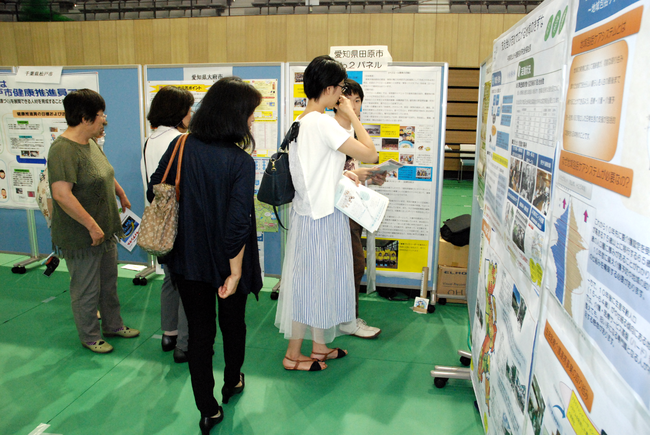 In the event, walking course was designated throughout the city so that participates can experience various events as lecture, health check, exhibition booth by health-related civil groups, green market, as well as exhibition booth by private companies. He mentioned that event contributes to heightening awareness and practice of health promotion among citizens, and appealed necessity of collaboration of governments, civil groups, and companies. 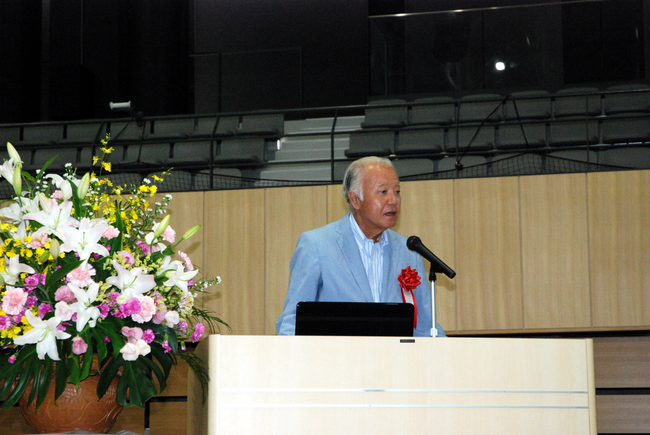 Mr. Okamura reported on "designing of walking courses that everyone can enjoy" and " building awareness from children to the elderly to participate health promotion". For walking, he introduced 18 courses, walking map, roadside of planting, rest areas, and information sign as hardware, followed by development of application of walking navigation for smartphones, walking event, point system for health promotion activities which are supported by civil volunteers as software. 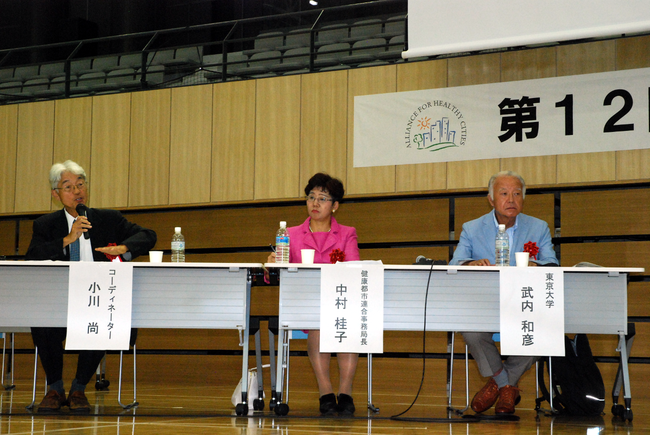 Finally, Mr. Isaki reported on the progress of the city’s health promotion policy. Referring to the fact that the city’s population increased 18%, 30% increase for children rearing generation and 40% increase for 65 years old or more, in ten years, he introduced leading policies targeted at these children rearing generation such as “recovery of green”, “security and safety”, “providing environments to enjoy sports”, and “healthy food”. 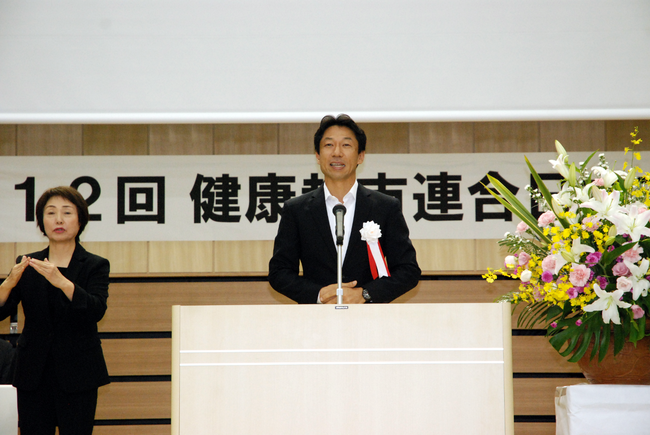 Specifically, he presented “utilization of locally produced ingredients to school lunch” and acquisition of private land for sports facilities. 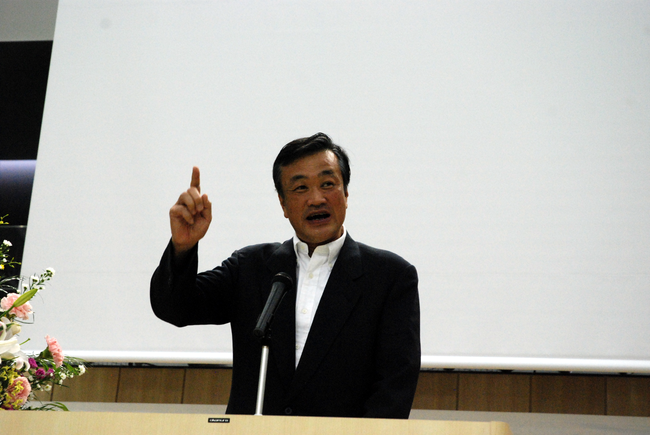 For above reports, Dr. Takeuchi pointed out that the direction of municipalities have changed, observing each mayors has viewpoint of focusing health & education, regarding health as broad concept, and managing infrastructure within the limited budget toward “Eco-health” which apprehends health of city and society itself. He also mentioned that theme of the conference relates all over Japan and expressed his hope to extend Japan Chapter’s activities toward unified direction. Dr. Namura pointed out that there are 4 approaches for developing cities with health. These are “safe mobility”, “healthy diet”, “symbiosis with nature”, and “human resource development”. She said that these activities reported fit within the category and requested to continue in long term and to involve citizens and specialists within the community; and concluded the panel by proposing Health Networking Conference both domestically and internationally. 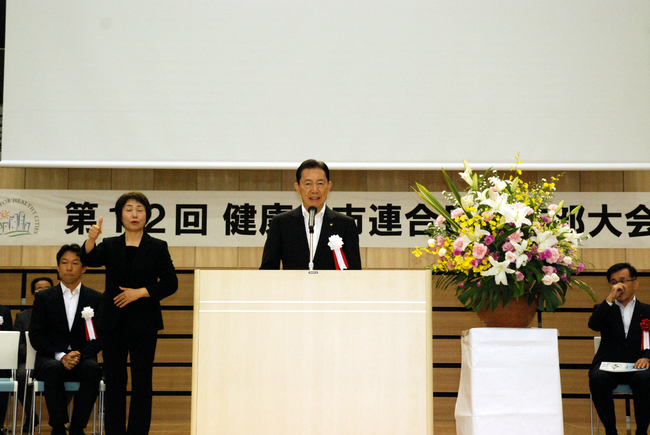 Mr. Mizutani, Mayor of Abashiri City, announced candidacy for hosting next conference. It will be held in Abashiri City in Hokkaido on July 4 and 5 in 2017. He appealed for delicious seafood, especially crab, and asked audience to visit the city. 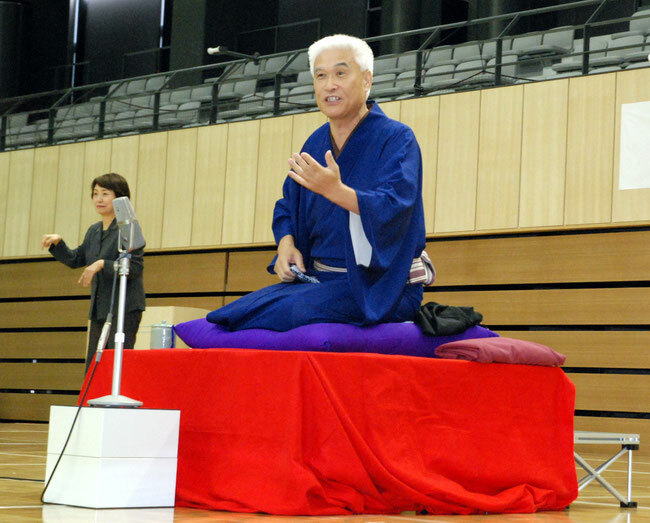 Closing the events, Sanyutei Kintaro, Master of Japanese Traditional Comic Story Teller, presented his story. Entire audience was excited with laughter. 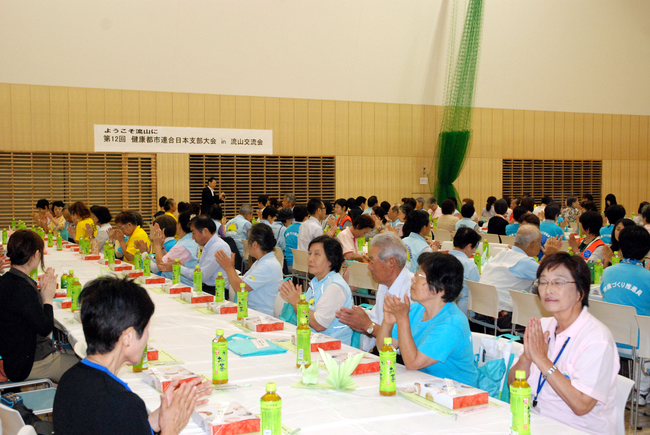 After the conference, luncheon meeting was organized by Nagareyama City’s voluntary civic groups. Seat of participants were mixed with other groups so that they can associate and deepen friendship. 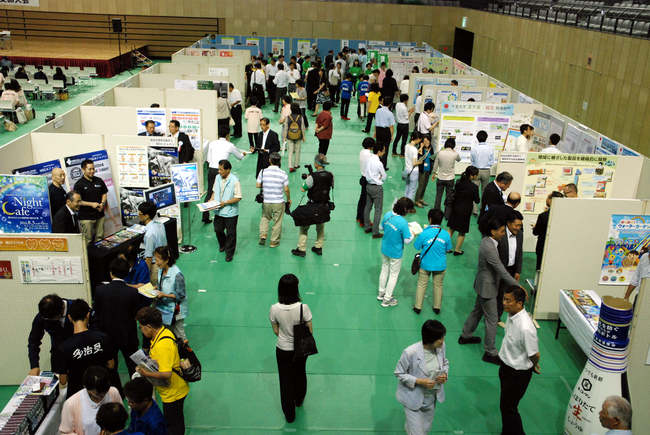 Panel corner for cities and exhibition booth by companies and organization were crowded with many people.